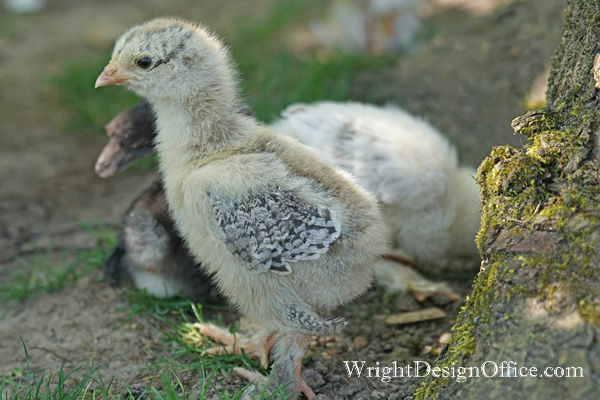 Every little yard into which small chicks are to be turned during the early spring should have several characteristics, if it is to be a suitable environment for the chicks. Not any or every yard is satisfactory. Smaller scale backyard chicken keepers can learn much from the larger operations and on many poultry farms one of the most serious criticisms that can be made is made of the yards outside the brooder houses. In the first place, the yards should he made on the South side of the brooder house. The chicks will only be turned out, at least early in the season, during the middle of the day when the sun is shining. The sun is invigorating an warming. There should be no Northern side of the house which is shadowed and where the little chicks may wander and become chilled. Another reason why the yards should be on the South side of the brooder house lies in the fact that the warm rays of the sun melt the snow and dry the ground much quicker here than on any other side of the house. It prepares the ground for the chicks. The Southern side of the house is most protected from the snows and driving rains of the winter season. In the second place, the yards should be very clean and sanitary when the chicks are first turned onto them in the Spring. This is mainly a matter of management during the previous fall. It is a well recognized fact that a yard in which there is a growig crop must have been plowed and tilled some time not far back, and this indicates that the surface soil has been turned under the fresh soil has been turned up. Chicks during the season drop much manure upon the small yards over which they range. If this is not turned under the yards the next Spring are not sanitary and safe for the new chicks. Especially in these days when it is so necessary to take every precaution against the spread of bacillary white diarrhea and gape worms in the chick yards is the matter of the sanitation of the yards very important. If a crop, such as rye or winter wheat, has not been planted in the small brooder runs the previous fall, the surface soil of the runs should be turned under either by plowing or spading before the little chicks are released from the indoor runs. This is not always possible in the early Spring when the first broods are being cared for, as the ground may be frozen and covered with snow. At such times having the yards seeded with a green crop which has gotten a fair start before the freezing weather set in will be mightily appreciated. In the third place, the outside brooder runs should be well drained. This is both a matter of soil character and systems of drainage applied. The sandy loams are most preferable for brooder runs, as much soils do not hold soil water long, allowing it to seep through the soil comparatively rapidly. The heavy soils, like the clays and red shales, are less desirable because they do not allow of this quick and sure seepage of soil or surface water down through the soil itself. These latter soils need most attention. Whatever the type of soil may be on any plant, prevent standing or stagnant water from collecting in the yards. Such pools are disease breeders and enemies of steady and healthy growth among the chicks. Make small ditches leading away from the little yards early in the Spring when the winter shows begin to melt and the spring rains come on. Perhaps it may be necessary in some cases to use tile drains beneath the surface in order to prevent the water soaked soils in the poultry yards. Get the ground in the small brooder runs dried out as soon a possible in the spring. Give this strip of land the first attention around the outside of the poultry plant. It will not take much time, but attending to it will mean a great deal to the little chicks that will be turned out upon the ground. Usually there is a small strip of ground right next to the house which dries soonest and which can be utilized by the baby chicks during the first few days. Applying these principles carefully means that one should locate his brooder house with regards to the possibility of making desirable runs to its Southern side, keep the yards and surrounding ground well drained, carefully tilled in order to keep the surface sanitary, and, if possible, winter over with a crop of fall sown rye. These are the kinds of runs that will be suitable for baby chicks. They need not be very large. An outside run or yard about eight by twenty feet is sufficient for seventy-five chicks up to the age of ten or twelve weeks when they will be from artificial heat and be ready for the larger ranges and the colony houses. Yards of this size will have to be spaded and tilled with rakes and hand cultivators, as they are too small for horse work. They are so essential to the successful rearing of the chicks through the first critical ten or twelve weeks that too much cannot be said of attention to their management.